We’re back with our next #GodzillaToyTakeover Video Feature, this time showcasing the 6-Inch Monster Figures. 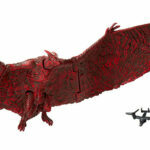 These larger-format versions of Rodan and King Ghidorah pack more detail and play features than smaller 3.5-Inch counterparts, and will soon be available as part of JAKKS Pacific’s upcoming Godzilla King of the Monsters toyline that coincides with the release of the film. Head over to our YouTube Channel or watch the video embedded above to see our impressions of each figure and it’s accessories. We also have more details about the 6-Inch range below, including price and availability. 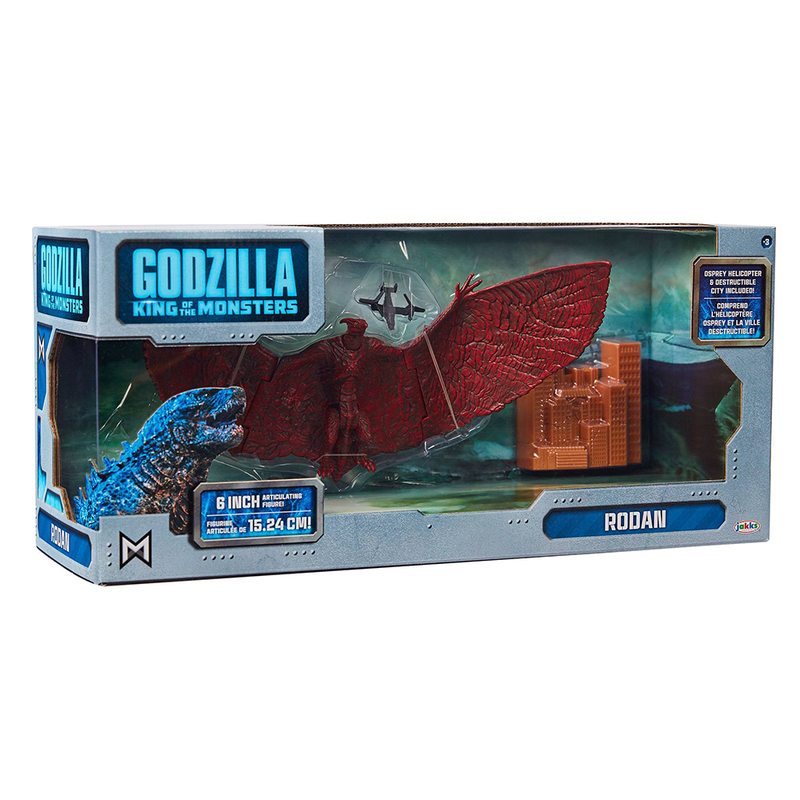 As noted in our unboxing video, these larger version’s of Rodan and King Ghidora by JAKKS Pacific not only feel like more signifiant figures in both size and weight, but also have more complex paint applications and excellent play accessories included in each box. Even with the same articulation as the 3.5-Inch figures, smaller upgrades like painted teeth and irises add to the quality seen in this assortment. The break-apart buildings and miniature scale vehicles are an excellent addition with these toys too. Similar to what was included with playsets released for the first Godzilla film in 2014, each destructible skyscraper fits and stays together quite well until a hapless monster crashes into it. The smaller vehicles look appropriately minuscule next to each 6-Inch figure, ready to be swatted out of the sky like flies. 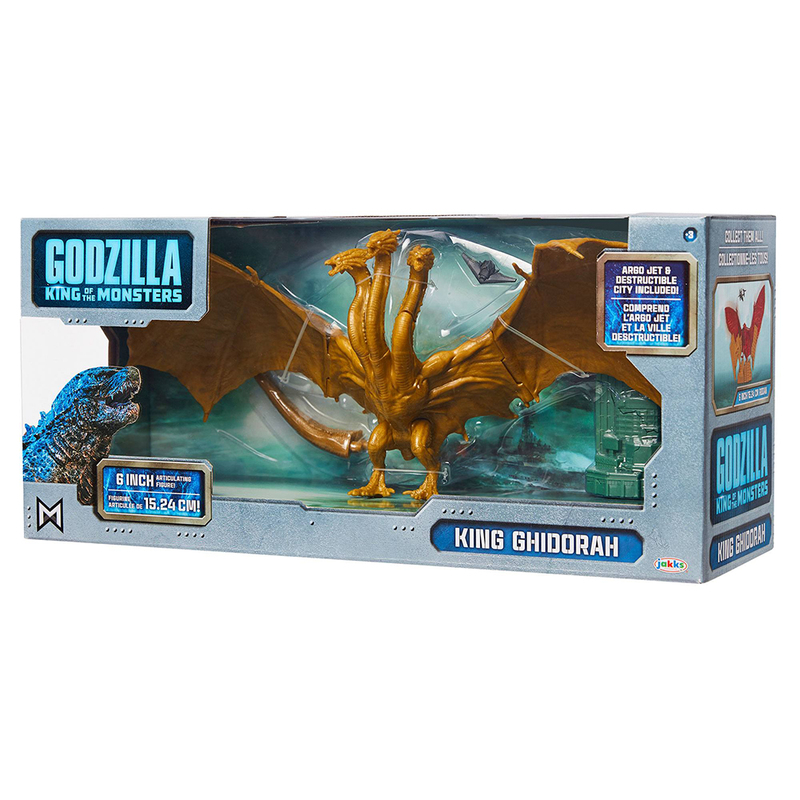 All of these elements come together in each pack to create, in our opinion, a pair of must-have toys for Godzilla King of the Monsters. Our gallery of official images and product information for the 6-Inch Monster figures provided by JAKKS Pacific can be viewed below. We hope you’re also enjoying #GodzillaToyTakeover on Collect Jurassic’s Instagram, Twitter and Facebook, where we’re posting even more Godzilla-sized content daily. Each 6-inch tall, articulated figure comes with a vehicle accessory and a breakable building accessory. 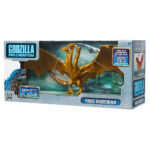 Collect the legendary monsters King Ghidorah and Rodan in this scale. These look really cool, but why on earth are only Ghidorah and Rodan represented? Godzilla and Mothra need six-inch-scale sets, too. It discourages me from wanting to get them knowing only two of the monsters have them. Will probably just get the two-packs instead unless they fix this issue.